Pest description and damage These sawflies are sporadic pests of alder in the PNW. The larvae of the green alder sawfly, a recent introduction to the PNW, have a light green head with dark eye-spots and a light green body with faint darker dorsal and side lines that help them blend with the leaf veins on the undersides of the leaves. Only one or two larvae will be found on a leaf and they lie straight rather than curled. Larvae chew holes in leaves that are delimited by major veins. Striped alder sawfly lays eggs in slits in the leaf petiole or main vein. Larvae hatch and begin chewing tiny erratic channels in the leaves; these coalesce and expand out to the margin, leaving only the tougher veins. 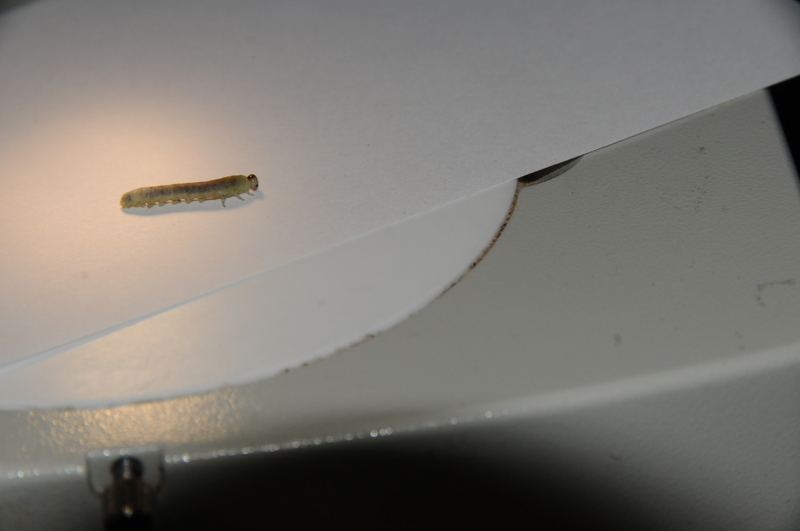 Larvae have a black head; the body has a dorsal green stripe and light sides with broken black lines along the sides. They line up along the edge of the leaf damage with their hind end curled up and out of the way. The woolly alder sawfly is found scattered in small groups on the undersides of newest leaves at branch tips. White wax covers the larvae; they rest in a U-shape and chew holes from the undersides of leaves. Birch sawfly also feeds on alder. Larvae are a pale, green with abundant black spots along the dorsum and two broken lateral stripes. It has an orange head with yellow or orange overtones in the posterior end. All these sawflies are capable of defoliating trees but more often damage is limited to large numbers of holes or localized defoliation scattered throughout the canopy. Biology and life history Larvae overwinter as prepupae or in cocoons in the soil until spring. However, some can remain in the soil through the summer and do not emerge until the next spring. Sawflies that emerge in spring mate and lay eggs in or on leaves. Striped alder sawflies lay eggs in slits in the petiole or main veins in spring when leaves are fully expanded and may have several generations in a year. Research is ongoing to define the number of generations in Washington. Pest monitoring Yellow sticky traps can be hung in alders in spring just as leaves are starting to unfurl. This removes the adults and limits the number of eggs but also helps determine the level of potential infestation. Egg slits are visible in the petiole and main veins if the plant is small. Look into the canopy and watch for a leaf with squiggly channels in the leaves or for early holes in the leaves indicating larvae are present. On native plants in wooded settings damage may be more tolerable than in a landscape setting. Damage rarely kills plants. Removing larvae on small plants early in the season will reduce subsequent generations. For reasons unknown, sawflies can delay adult emergence for a year or more. They may be responding to environmental cues such as soil temperature, soil moisture or other factors. Little is known about biological control of sawfly larvae. Potential natural enemies include yellowjackets later in the season, and true bugs have been seen feeding on larvae. Parasitoids may also regulate the frequency of heavy infestations. Furniss, R.L. and V.M. Carolin. 1980. Western Forest Insects. USDA Forest Service, Misc. Pub 1339.